I look at him every day through those grills. The bars of the cage makes me flounder to get a picture of him. He is very timid and most of the times he just sits around in the cage staring at the television which I keep watching everyday not knowing whether he really understands what I am watching. Mostly, World Movies. He blinks his eyes just sways his neck and his claws perched on a swing inside the cage. He gets down as soon as he sees that there are chilies, chapattis or fruits tossed inside his cage. Slowly he pecks at the food inside the cage, with relish enjoys the few bites and drinks the water on the other tray in his cage and goes back to his sweet spot, the swing on which he perches himself gracefully and goes back and forth with the swaying of his neck. In the evening, I open the doors of the cage and let him out so that he can play outside take a walk in the room and play around. But he prefers to struggle his way up and climb on top of the cage and jump around on the cage. When I call his name, he looks at me but does not respond much except for a timid crawl back and forth on top of the cage and again he wanders off in his own world. 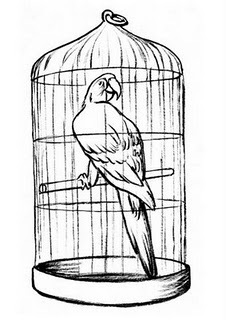 Sometimes inside the cage, he pecks at himself, scratching his wings and trying to get rid of the fleas probably. After he has had a bath, he shakes his body vigorously to get rid of all the water that his body has soaked. I guess he doesn’t’ enjoy his showers much. When he is asleep, he seems like a peaceful bird perched on the swing in his tranquil, the most content creature in this entire universe. Meet Sam, my newest pal and my pet parrot!